The University Materials Institute of Alicante (IUMA) was created in January 2004. In this page the main objectives of the Institute are described as well as a brief description of the constituent groups. 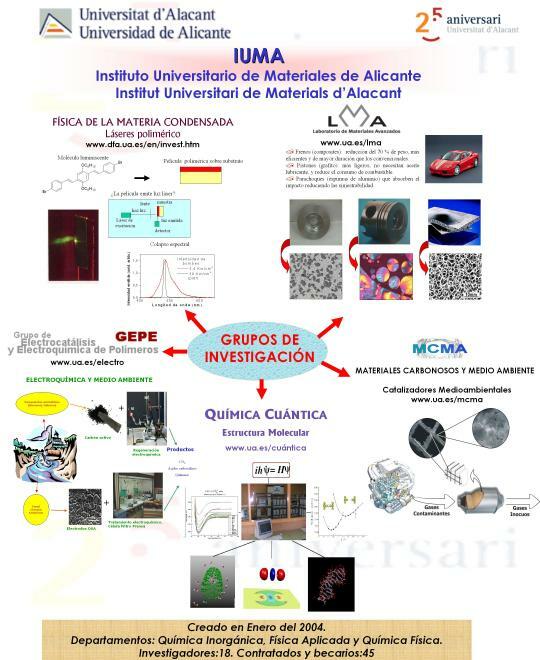 These groups are integrated by academic staff from five Departments of the University of Alicante (Inorganic Chemistry, Physical Chemistry, Analytical Chemistry Nutrition and Bromatology, Applied Physics and Pharmacological Optics and Anatomy) clearly reflecting the necessary multidisciplinary character of the materials area of knowledge. It is important to highlight the participation of groups from five different Departments with a total of 37 full-time employees, one of them being a Ramón y Cajal senior research fellow and two Juan de la Cierva research fellows. On the other hand, a large percentage of the Institute members take part in the PhD Program in Materials Science which is currently taught the University of Alicante. The industry sector has a considerable relevance in the province of Alicante. A large part of this industrial activity is related to diverse aspects of Materials Science and Technology: raw materials, materials extraction, processing, and fabrication of the end products. A prominent example of this important activity is the multinational firm Alcoa which has one of its Spanish plants in Alicante, as well as one of its European Research Facilities in Europe. This enterprise is one of the most important in the province and its activity, aluminum and its alloys extraction and processing, in completely focused on the materials area. Alcoa has subscribed a framework agreement with the University of Alicante and a specific convention on the fabrication of metal matrix composite materials. Likewise, the development of materials of potential usefulness for contamination control both in gas and liquid phase (adsorbents, catalysts,...), is another area of great interest in the province and the region of Comunidad Valenciana which constitutes another example of the relevance of research on Materials Science and Technology.